Not to be confused with World 1-7, Level 1-7, or Stage 1-7. Area 1-7 is the seventh course of Coaster Hills and the seventh course overall in Mario vs. Donkey Kong: Mini-Land Mayhem!. It introduces Circus Kongs. The level features two Mini Marios, though not necessarily in the same starting position. 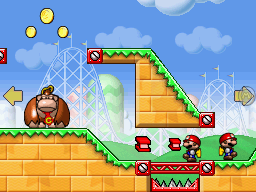 One Mini Mario begins on the lower level way over to the right, while the other begins atop a slope just over to the top left, with the exit door atop a slope right next to the bottom Mini Mario. In order to reach it, the bottom Mini Mario must be activated first, and use the Circus Kong and Warp Pipe on the other side of the level to loop around to the right and activate the other Mini Mario. They will both then slide down a steep slope to the exit. The M-Token is located at the bottom of the slope leading to the exit door. It can simply be collected by sliding into it, given that a Red Girder is constructed just above it. The Mini Mario Card is located on the bottom level, right next to the Warp Pipe entrance. It can be collected simply by approaching the Circus Kong from the left and entering the Warp Pipe from the top. This page was last edited on September 18, 2018, at 03:48.